Guinness record holder for the most expensive burger is served by New York’s Serendipity. What are you eating in a burger that cost $295? 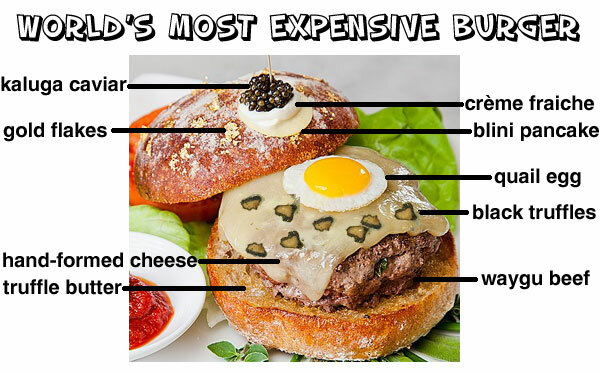 The world’s most expensive burger is a made from Japanese waygu beef topped with hand-formed cheddar cheese, shaved black truffles, a fried quail egg, and served on gold flecked roll slathered with truffle butter and garnished with a blini pancake, crème fraiche, and kaluga caviar. Image based on the photo (didn’t have truffles on it) on Serendipity’s facebook page.